Michael Clow is the owner of TheYachtsman.Com. 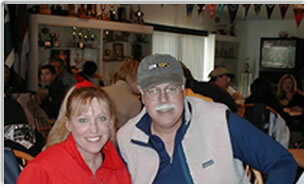 He has sold Henri-Lloyd foul weather gear for 31 seasons and Gill foul weather gear for 27 seasons. Michael has used synthetic layering systems for 35 years in outdoor activities such as sailing, boating, alpine skiing, nordic skiing and running. 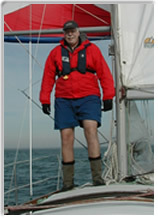 He continues to race and cruise on the Great Lakes, with brief adventures on the Atlantic, Pacific and Southern Oceans. There are hundreds of satisfied customers in Southeastern Michigan (Metro Detroit) where he has sold Gill & Henri-Lloyd foul weather gear for many years. Before any sale, your needs are examined and prioritized. Sometimes existing gear just needs to be used differently. Please feel free to email Michael with any questions about developing a system of quality apparel for your marine activities. With this approach you can focus on marine fun and not the weather! In order to accomplish this we take a system approach to your apparel. We will inquire about what kind of boating you are doing, what kind of apparel you already own & what other outdoor sports you play. With a bit of planning, much of your apparel can be used for many outdoor activities. We are your advocate. That means we will evaluate your existing apparel and then prioritize any needs for additional apparel. Sometimes your existing gear just needs to be used differently. Let us earn your trust before a sale is made.